North Wales is a haven for lovers of the outdoors, offering UNESCO preservation sights, animal sanctuaries, national parks, stunning coastlines and ancient ruins. It has thousands of years of enthralling history, and you can lose yourself in the many mystical legends and myths of these magical lands. Deep in the heart of Snowdonia this is stunning walk, allow a full day. On approaching you will be faced by a monolithic, dark cliff face, the Devil's Kitchen. Or, as it's really called, Y Garn (Glyderau). At the foot of the cliff is a lake which often looks black due to the reflection of the rock. You hike up around this gargantuan cliff and eventually arrive at the top, where you will witness some of the most incredible views overlooking the mountainous valley to the sea. From the charming town of Conwy you take the Sychnant Pass, which is a snake like road which winds up into the mountains. 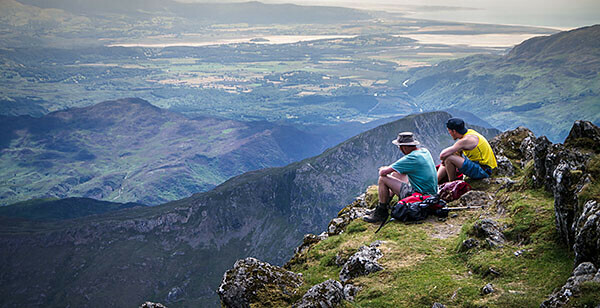 From here there are a whole load of routes to take, you will need to purchase an Snowdon (OS Explorer Map)Ordinance Survey map from Conwy. I would recommend parking above the Penmaenmawr valley, and walking up to the peak where they have an ancient Druid stone circle. On the pagan holidays you will still find this ancient religion practised on this sacred spot. Beddgelert translates as ‘Gelert’s Grave’, referring to the faithful hound of Medieval Prince Llewelyn. Legend has it that the prince arrived home one day to find his son absent from his cot. Gelert enthusiastically greeted his master as usual, apart from having blood all around his mouth. Frenzied, Prince Llewelyn plunged his sword into the hound, however almost the simultaneously, he heard the cry of his child and heir. He ran to find his boy who was fine, but close by was the body of a wolf that the dog had killed to protect the child. Beddgelert is a village in the heart of Snowdonia, and you can take the charming and popular walk to the monument of ‘Beddgelert’ where the body of the faithful hound rests. It is a few miles away from the village, but a pleasant, flat and scenic walk alongside the river to get there. Betws-Y-Coed is a traditional, picturesque postcard village that will take your breath away. Quintessentially Welsh, sporting dry stone walls, grey brick bridges and higgledy-piggledy buildings made with stone off the local mountains. It is a hub for rock climbers, hikers, campers and the like, with plenty of fantastic outdoor shops. Just up the road you have the magnificent Swallow Falls, an incredible waterfall buried deep in the woods. You can stand and overlook the falls on an ancient bridge. Close by you also have the famous Ty Hyll, ‘the Ugly House’, which is certainly worth a visit whilst in the area. A hiking holiday to North Wales would not be complete without at least visiting the base of Mount Snowdon, the 3560ft giant that is the highest mountain in both Wales and England. It is a great walk, with an assortment of routes to suite all abilities. This is a truly magnificent region and is a nature lovers’ paradise, its untamed beauty is right there just crying out to be discovered. Be prepared, bring sensible footwear, water and snacks, and always take a jacket as the climate often changes for lower temperatures at altitude. Be safe, have fun and enjoy! Last updated by jack on 04 March, 2014 in Travel. Beddgelert translates as Gelert's GRAVE not his bed!